With determination and sheer ‘Ox-Power’, our Jude, at the mighty age of 8 years, rides from the university city of Oxford, to the very centre of our fine capital in London. A total 62 miles! Early on a sleepy Sunday morning our hero climbs upon the statue of a Cow. This memorial is a tribute to when the city was a popular crossing for herds. Today it becomes the starting point for a thrilling ride to London. 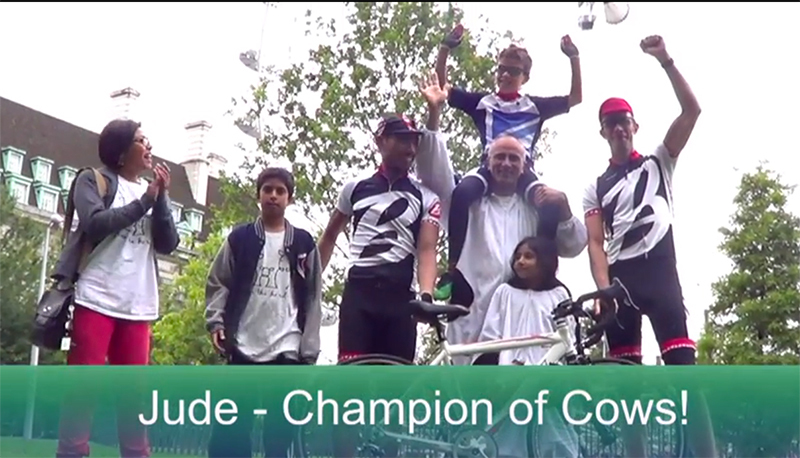 Our young Baroudeur volunteers for the charity, AhimsaMilk, with the aim of raising awareness to exploited dairy. Rolling through the Chilterns, it’s marvelous to see Jude in cycle-action. He is both competent and confident; taking the hills with vigor and the descents with coolness. Jude declares it’s the fastest he’s been on a bike! As we weave through the country, we are thankful for the support and the delicious Sushi that aids us in recovery. Before we know it, we’re on the outskirts of London, and as the river approaches, the final leg is within sight. There to await the Champion of Cows is a cheering crowd and a tasty homemade cake to satisfy the hero!